On 19 May 2015, we commemorate the sixth anniversary of Sri Lanka’s triumph over the LTTE separatist terrorism. This great victory preserved the territorial integrity and unitary status of Sri Lanka which has continued to be indivisible for well over 2500 years. The resulting peace has also encouraged economic development, opened up the nation to the outside world and brought greater stability to the South Asian region and the Indian Ocean Rim. We gratefully remember the supreme sacrifices made by the men and women of the Sri Lankan Armed Forces, the Civil Defence Force and the Police, their families as well as numerous civilians in the three decade long struggle against this terrorist outfit. We also acknowledge the political leadership of President Mahinda Rajapaksa and the Defence Secretary Gotabhaya Rajapakse as well as the military skill and commitment of the Service Commanders Sarath Fonseka, Wasantha Karannagoda & Roshan Gunetileke who guided the Sri Lankan armed forces. The Sri Lankan people were at the receiving end of the brutal terrorism of the fascist LTTE during this dark period when thousands of civilians of all ethnic backgrounds were killed by the LTTE using every violent method including cutting up with machetes & daggers, exploding bombs in buses, trains, public buildings, public roads and using land mines. Untold damage was also caused to the infrastructure of the country. The objective of the fascist LTTE was to carve-out a separate mono-ethnic racist country for Tamils in the North and the East of Sri Lanka, which they claimed to be the traditional homeland of Tamils. This myth of Tamil Elaam could not be substantiated by any historical, demographic or geographic measure. The dream of the LTTE was nurtured and supported by extremist Tamil elements living overseas and aided by several foreign funded NGOs. Some politicians in the West and India driven by electoral sensitivities and geo-political objectives not only became apologists for Tamil separatism but covertly intervened to prevent the government and the armed services of Sri Lanka from militarily overcoming the LTTE. Even though Sri Lanka was pushed into so called peace discussions with the LTTE on several occasions, the LTTE’s fanatical belief in a separate country forced Sri Lanka and its international partners to abandon the peace negotiations and resume armed action against the LTTE in 2005. In the ensuing battles, more than 290,000 Tamils, including 6,000 child soldiers, were saved by the defence forces from the clutches of the LTTE who had used them as a human shield. While we gratefully acknowledge the help extended by countries which assisted Sri Lanka by providing arms, equipment and intelligence required for the victory, we regret the ongoing efforts of countries such as the USA, UK Canada and India for encouraging the LTTE remnants and their allied forces by attempting to tarnish the image of Sri Lanka and its security forces at the UNHCR based on unsubstantiated claims and questionable reports of those who are inherently hostile to the nation. Furthermore, we remain concerned by recent politically motivated attempts within Sri Lanka to squander away the national security and economic gains of the past decade by downplaying the role of its security forces, closing down strategic defence establishments and allowing land-grabs by racist politicians while appeasing the LTTE remnants and their apologists in the name of unreciprocated ‘reconciliation’. 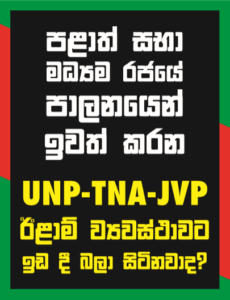 Sri Lankans, while rejoicing at the task of demolishing the fascist LTTE and their allies, should now resolve to march ahead as a prosperous and peaceful unitary nation shared by all of its citizens. Sinhala Cultural Association of Australia Inc.